Hide glue is the traditional woodworking purist's choice and that is for good reason. While traditional woodworkers have available today a myriad of other choices, plain old hide glue is still hard to beat. That is not to say that we think hide glue is always the best choice, but most of time we would recommend hide glue. For some casual woodworking projects, we use a yellows carpenter's glue. We don't offer this type of glue because it is best to buy it frequently to keep it fresh and you can buy it very cheaply at your local K-Mart. While hide glue has many advantages for traditional woodworkers, it can requires a bit more care to use. Powdered hide glue must be mixed with water to use. Generally speaking you want to acheive a consistency about like that of honey. You will learn with practice what mixture is best for what you are doing, but a good starting point is a 50/50 mixture by volume of glue and water. Hide glue must be kept warm when being used. We offer a thermostatically controlled glue pot for this purpose, but the easiest thing in the home shop is to use a coffee mug heater. If the glue gets too hot is it ruined and if it is not hot enough it won't bond well. If you workshop is cool, you will need to heat the surfaces to be glued before applying glue, such as with a hair dryer. So you might ask, why use hide glue when I can squirt any other glue out of a tube. Hide glue joints have held well on antique furniture that is hundreds of years old, yet if you do need to pull a joint apart, with moisture and heat a hide glue joint can be reversed without damaging the workpiece. Try that with any modern glue and you get broken pieces. Hide glue gets tacky almost immediately, so often things like moldings can be put on without clamps. This can be really handy for things that are hard to clamp. Hold Heet thermostatically controlled glue pots are available in pint (approx 1/2 litre), quart (approx 1 litre), and larger sizes on special request. The pint size Hold Heet glue pot is ideal for use with hide glue in a home shop. The quart size Hold Heet glue pot is ideal for heating hide glue for use in small commercial shops. The quart size glue pot is generally too big for home shops. 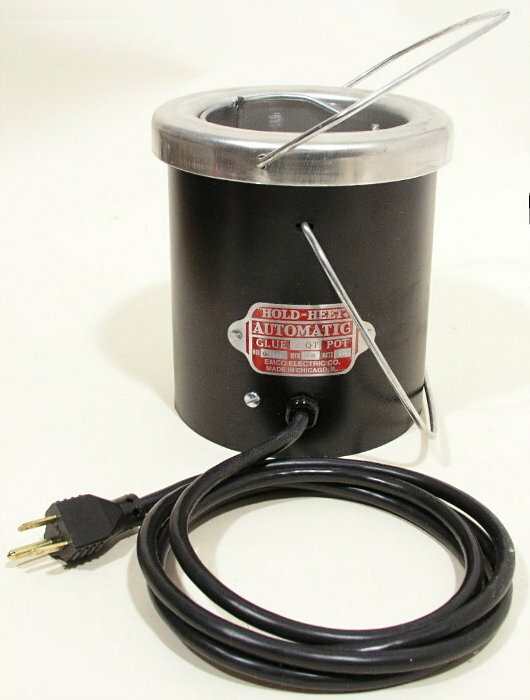 The version sold in most mail order catalogs is the Hold Heet 1 quart glue pot with aluminum liner and no lid. LINER-CO Replacement Copper Liner for 1 Quart Glue Pot SALE! All the glue pots listed below are for 230 volts. Because of the various plugs used in different countries, we sell this unit with a cord which requires you to install your own plug. G-2301AL-NL 1 Quart - Aluminum Liner - No Lid - 230 Volts SALE! G-2301AL-WL 1 Quart - Aluminum Liner - With Lid - 230 Volts SALE! G-2301CL-NL 1 Quart - Copper Liner - No Lid - 230 Volts SALE! G-2301CL-WL 1 Quart - Copper Liner - With Lid - 230 Volts SALE!